British heavyweight Tyson Fury will make his American debut against former IBF cruiserweight champion Steve Cunningham on 20 April. 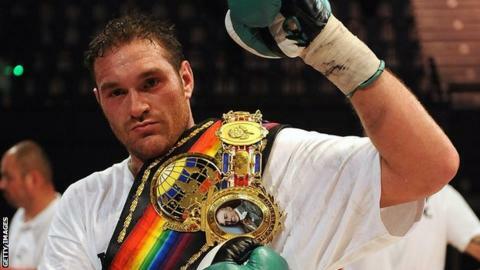 Fury, 24, will meet the American at Madison Square Garden in New York. "I'm looking to put on a devastating performance - the best of my career to date," said Fury, who has won all 20 of his professional bouts. "Cunningham's got all the tools - a former world champion, good fighter, he's got a lot of skill." Victory in the IBF eliminator fight would move Fury a step closer to a meeting with WBA, IBF, WBO and IBO world heavyweight champion Wladimir Klitschko. "I'm absolutely ecstatic to be fighting at Madison Square Garden," added Mancunian Fury. "It goes back in history and I can't wait to put my name with a long list of champions who have fought there. "I'm a historian of boxing myself so this is definitely the pinnacle of my career so far." Cunningham, 36, lost his cruiserweight crown against German southpaw Yoan Pablo Hernandez in October 2011 and has since lost two of his three bouts. He was defeated by New York-based Pole Tomasz Adamek in his last fight, for the IBF North American heavyweight belt, in December. "I'm looking forward to getting back in the ring," said Cunningham. "For the first time in my career I have a guy coming to my country to face me. I am certain he's never faced a fighter like me." Former Irish heavyweight title holder Fury has made no secret of his desire to fight Liverpool's David Price for his British and Commonwealth titles. Fury has repeatedly used his Twitter account to declare his interest in meeting Price, who fights American Tony Thompson at the Liverpool Echo Arena on Saturday. However, Fury's promoter Mick Hennessy dismissed a guaranteed purse of £650,000 for his man to face the Liverpudlian, according to Price's promoter Frank Maloney.